Having been a high school teacher for ten years, I've had my fair share of first days of school, but never one that required traveling almost 9,000 miles and rehearsing my introduction in Swahili. As you can see in the picture below, my pronunciation is quite funny. I'll keep working on it. At least I only brought one teacher to tears from laughter. "Hey- I learned my swahili from a book okay?!" I'm glad I didn't have to drive myself through Nairobi when I arrived: multi-lane round-a-bouts, right-side steering and driving on the wrong side of the road would have proved excessively challenging. Throw in the motorcycles, donkeys, trucks with no headlights, and fearless matatu drivers, I doubt I would have ever made it. I'm glad I had 2 nights in Nairobi to start resetting my internal clock forward 10 hours as I was lulled to sleep by the melodic Muslim prayer echoing through the city streets, a personal first. Everyone was very nice and sharply dressed, sentiments that carry throughout the country. I was very happy to see Alyssa waiting in the lobby of the Iten airport and equally as happy to see my checked bag! Local jack-of-all trades Timo was also there to give me a ride to the High Altitude Training Centre. As we climbed out of the hotter, drier savanna up the escarpment to Iten, the temperature didn't really cool down so my tired, warm brain just tried to take in as much of the countryside as I could. Alyssa and I caught up on the recent happenings with the project. We arrived in time for chai tea (another first for me) and then had to walk to the market to buy as many boiling pots as we could afford/carry since we had just added a third school of 200 more girls thanks to some generous last minute donors! No rest for the weary, eh? Alyssa knew a guy (which is the way nearly everything works around here) so we bought 90 pots with the understanding we'd be back for more the next week. Because the pots were heavy, we jumped on a boda boda (motorcycle taxi) and somewhat awkwardly made our way over speed bumps, around pots holes, and past the throng of tractors, buses, other motorcycles, pedestrians, and the occasional farm animals back to camp. Dinner included a first I had been looking forward to: tasting ugali. It is a secret superfood of the Kenya marathoners I had been reading about. It is mostly tasteless with a texture of compacted couscous. I met many international runners and Alyssa and I started planning the coming week. 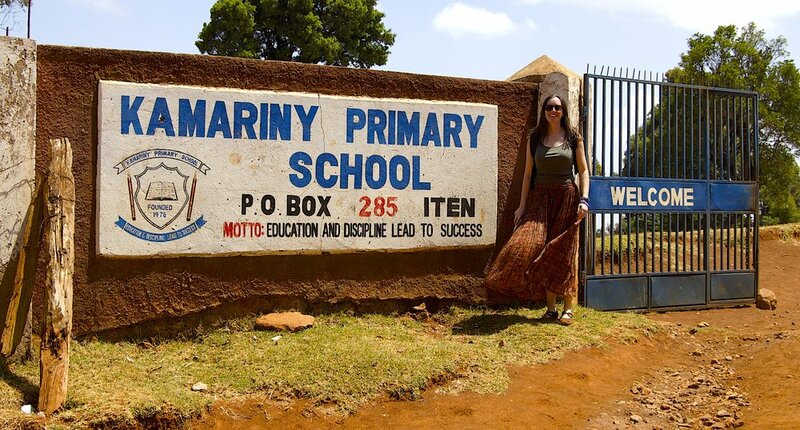 Tuesday finally arrived and we headed over to Kamariny Primary School to meet the 7th and 8th grade girls Alyssa had been working with since she first arrived about 4 weeks ago. These girls have already received their Ruby cups. We began teaching the girls about the four parts of a woman's monthly menstrual cycle after my hilarious attempts at introducing myself in Swahili. Just a heads up, the swahili word for nephew sounds just like the word for dog. Sorry Simon. They were already familiar with some internal anatomy terms from their science class. The days of the cycle seemed to be new information which they dutifully copied into their notebooks. We should have stopped there to let the 8th graders get to their next class but got caught up in making a 2018 calendar to track their cycle. It was an adventure in graph paper and colored pencils. The girls remained perpetually polite even when we kept them an extra half hour! Where does the Ruby Cup go? Can you point to the fallopian tubes? The next day was the first day for everyone involved at the newly acquired St. Peter's Iten Secondary School. The differences here are stark including dealing with all 200 girls at once out in a field for only 30 minutes at the end of their lunch period. How do you teach with no chalk board? When the girls would have to write on their knees? When there is no hope of learning everyone's names? Again, the girls were just lovely, even the ones from the school next door who were listening over the fence. We got through intros and passed out the waivers. The erasers were a bit hit here, too! The next day at camp, Alyssa and I altered our 'parts of the cycle' lesson onto some strips of paper that we can hold up in place of writing on a board. Never a dull moment here in Kenya, and plenty of opportunity to get creative.